Picture a treasured, pristine newborn, just beginning the voyage of life. Imagine a baby who hasn’t yet picked up the habits or tastes you wish you never had. Let it sink in – the organs and metabolic settings your baby is developing will be assembled from (and in response to) the food she eats. She deserves the best. Food quality from chemically-intensive agriculture is going down. According to USDA data25, when you eat the same foods as your grandparents ate 50 years ago, you are getting less protein, iron, calcium, phosphorus, riboflavin, and vitamin C – to say nothing of the thousands of important food phytonutrients that hadn’t been discovered yet when the measurements began. You don’t want so skimp on food for your baby. You don’t want foods with declining nutrients, grown from depleted soil. You don’t want over-processed baby foods that may prepare her to prefer processed foods as a toddler. If I were going to pick only one time of life to eat organic, it would be from conception through age 3. Our bodies and our brains grow faster during this period than at any later time. 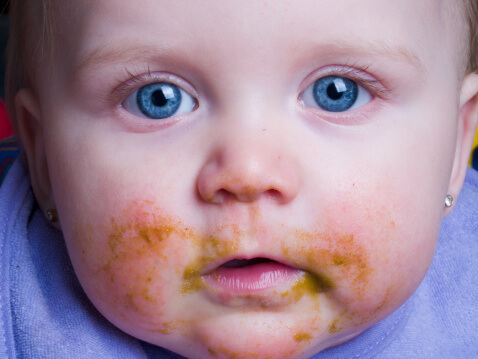 Babies eat more than adults, pound for pound, and they are more vulnerable to environmental toxins. The EPA has concluded that carcinogens average 10 times the potency for babies than for adults, with some chemicals up to 65 times more powerful26. The EPA does not yet have a formal policy addressing babies’ exposure to chemicals that affect their bodies in other ways, such as their hormones, immune systems, or their brains – even though babies are clearly more vulnerable. For instance, a recent study is the latest to suggest that early exposure to a significant pesticide, chlorpyrifos, is linked to decreased intelligence, and an increased chance of developmental delay and of ADHD27. Other research has shown that choosing a mostly organic diet can now almost eliminate exposure to chlorpyrifos and other organophosphate pesticides in children28. Baby food makes it on the list primarily for the health of your own family, but also with an eye toward raising a generation that appreciates the value and taste of organic whole foods. For our generation so far, only 0.5% of US agricultural production is organic29. Let’s start now to make the percentage of organic cropland far higher in our children’s generation. Dr. Greene’s Organic Rx — What you need to know! 25Davis D, Epp M, and Riordan H. Changes in USDA Food Composition Data for 43 Garden Crops, 1950 to 1999. Journal of the American College of Nutrition, Volume 23, Number 6, December 2004. 26EPA (U.S. Environmental Protection Agency). Supplemental guidance for assessing susceptibility from early-life exposures to carcinogens. EPA Risk Assessment Forum. EPA/630/R-03/003F. March 2005. 27Rauh VA, Garfinkel R, Perera FP, Andrews HF, Hoepner L, Barr DB, Whitehead R, Tang D, Whyatt RW. Impact of Prenatal Chlorpyrifos Exposure on Neurodevelopment in the First 3 Years of Life Among Inner-City Children. Pediatrics. 118(6):e1845-e1859. December 2006. 29USDA Economic Research ServiceOrganic Production Data Sets, December 15, 2006.